Best. Sled. Ever. These Badass Sleds Are Built for "Full-Contact Racing"
Do you ever wish your crappy sled had a hand brake? How about a roll cage? If your only goal is to make it down the hill before anyone else... by any means necessary... then the Sledoon might be just the sled for you. This concept design won first prize in the UK IOM3 Design Innovation in Plastics competition in 2003, and it's easy to see why.. it looks like a total blast. 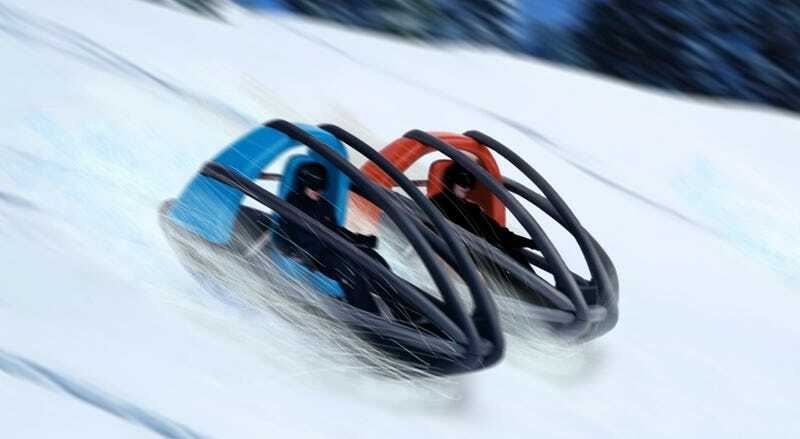 The Sledoon was created specifically with "full-contact racing" in mind, meaning you're supposed to use them to slam into one another on the way down the hill... they'll even keep sliding when they get knocked upside down. Unfortunately, they're just a concept, and as far as we can tell haven't even officially been produced. Bummer. Someone get on that, will you? If you're looking for a place to hit the slopes this winter, full-contact or not, check out the interactive powder guide below! Use Roadtrippers to plan your winter adventures. Follow us on Twitter and Facebook.